Jeff had gotten Jessica a headset for her birthday back in October as he was getting current again with his pilot license. Well...the headset sat unused in a box for a few months. 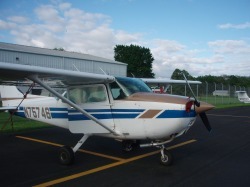 Jeff had joined Civil Air Patrol so he was getting nearer taking Jessica out in a plane. After a few failed attempts plans were set to go flying on Saturday morning - the birthday present was cracked out a dusty box and was going to see the light of day! 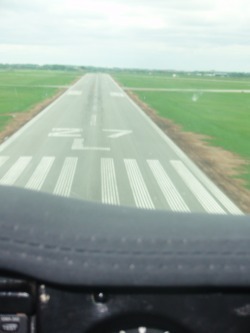 The plan was to go for "a hundred dollar breakfast" in Urbana...meaning rent a plane, fly to Urbana, and get breakfast at the restaurant off the runway - not leaving the airport. This was going to be tricky, there were storm clouds in the sky, and winds gusting to 45mph. It was unsure if the flight would be cleared. It was. But Jeff was not being able to check out the plane! A few frantic phone calls were made and an extension was granted on the return time of the plane. They were off! Thanks to the gusting winds Jeff got the plane air born in 50 feet - record take off for him. 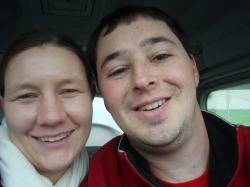 Jessica and Jeff flew over familiar sites, their first apartment in Dublin, both their work places, Laila's dog park...making their way VERY SLOWLY to Urbana. There was no "hundred dollar breakfast" though. The wind was pushing back at those 45mph winds so it took over 45 minutes to fly to Urbana, so they settled for circling the airport and returning back to the OSU airport. On the way back Jeff anxiously asked what Jessica thought of the flight being Jeff's first passenger and their flight together. Jessica said it was somewhat like she expected - just off the beaten Port Columbus flight path and closer to the ground which was nice seeing familiar things in the air. At that moment, Jeff had been holding her hand, and he got her attention - and with the ring poised Jeff asked Jessica if she would marry him. Jessica was definitely surprised! 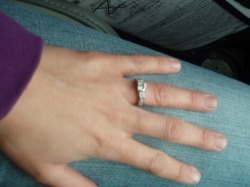 And said yes after a pause to figure out that this was really happening. The first flight for this couple was memorable. They landed safely against the wind gusts, and best of all engaged. Aww...and yes I did cry!